« Jennifer Eberhardt Wins MacArthur! This post was first published on November 21, 2007. Thanksgiving has many associations — struggling Pilgrims, crowded airports, autumn leaves, heaping plates, drunken uncles, blowout sales, and so on. At its best, though, Thanksgiving is associated with, well, thanks giving. The holiday provides a moment when many otherwise harried individuals leading hectic lives decelerate just long enough to muster some gratitude for their harvest. Giving thanks — acknowledging that we, as individuals, are not the sole determinants of our own fortunes seems an admirable, humble, and even situationist practice, worthy of its own holiday. But I’m interested here in the potential downside to the particular way in which many people go about giving thanks. Whether because of discrimination on the basis of race, ethnicity, religion, social class, gender, or sexual orientation, or because of policies and programs that privilege some at the expense of others, or even because of historical accidents, genetic disparities, or the fickleness of fate, certain social systems serve the interests of some stakeholders better than others. Yet historical and social scientific evidence shows that most of the time the majority of people—regardless of their own social class or position—accept and even defend the legitimacy of their social and economic systems and manage to maintain a “belief in a just world” . . . . As Kinder and Sears (1985) put it, “the deepest puzzle here is not occasional protest but pervasive tranquility.” Knowing how easy it is for people to adapt to and rationalize the way things are makes it easer to understand why the apartheid system in South Africa lasted for 46 years, the institution of slavery survived for more than 400 years in Europe and the Americas, and the Indian Caste system has been maintained for 3000 years and counting. Manifestations of the system-justification motive pervade many of our cognitions, ideologies, and institutions. This post reflects my worry that the Thanksgiving holiday might also manifest that powerful implicit motive. No doubt, expressing gratitude is generally a healthy and appropriate practice. Indeed, my sense is that Americans too rarely acknowledge the debt they owe to other people and other influences. There ought to be more thanks giving. Nonetheless, the norm of Thanksgiving seems to be to encourage a particular kind of gratitude — a generic thankfulness for the status quo. Indeed, when one looks at what many describe as the true meaning of the holiday, the message is generally one of announcing that current arrangements — good and bad — are precisely as they should be. Existing levels of prosperity, by this account, reflect the merciful and omniscient blessings of the “beneficent Author” of all that is good. The faith that we are being “watched over” and that our blessings and prosperity are the product of a gift-giving force is extraordinarily affirming. All that “is,” is as that “great and glorious Being” intended. Fom such a perspective, giving thanks begins to look like a means of assuring ourselves that our current situation was ordained by some higher, legitimating force. To doubt the legitimacy of existing arrangements is to be ungrateful. If we are supposed to be thankful for our jobs even when we are “overworked and underpaid,” should we also be thankful for unfairness or injustice? And if we are to be grateful for our sorrows, should we then be indifferent toward their earthly causes? That advice seems to mollify any sense of injustice by giving something to everyone. Those with bountiful harvests get to enjoy their riches guiltlessly. Those with meager harvests can be grateful for the fact that they live in a country where they might someday enjoy richer returns from their individual efforts. [M]aybe you are unsatisfied with your home or job? Would you be willing to trade either with someone who has no hope of getting a job or is homeless? Could you consider going to Africa or the Middle East and trade places with someone that would desperately love to have even a meager home and a low wage paying job where they could send their children to school without the worry of being bombed, raped, kidnapped or killed on a daily basis? No matter how bad you think you have it, there are people who would love to trade places with you in an instant. You can choose to be miserable and pine for something better. You could choose to trade places with someone else for all the money they could give you. You could waste your gift of life, but that would be the worst mistake to make. Or you can rethink about what makes your life great and at least be happy for what you have then be patient about what you want to come to you in the future. If your inclination on Thanksgiving is to give thanks, I do not mean to discourage you. My only suggestion is that you give thanks, not for the status quo, but for all of the ways in which your (our) own advantages and privileges are the consequence of situation, and not simply your individual (our national) disposition. 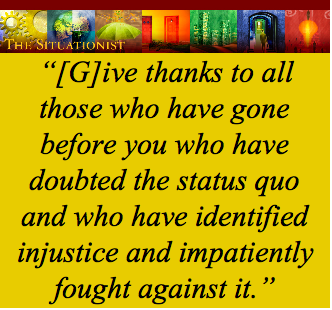 Further, I’d encourage you to give thanks to all those who have gone before you who have doubted the status quo and who have identified injustice and impatiently fought against it. System Justification Theory and Law. This entry was posted on November 26, 2014 at 12:56 am	and is filed under Altruism, History, Ideology, System Legitimacy. Tagged: Aaron Kay, John Jost, System Justification, System Legitimacy, Thanksgiving. You can follow any responses to this entry through the RSS 2.0 feed. You can leave a response, or trackback from your own site.